The centerpiece of the Holy Land is, of course, Jerusalem. Tours in Jerusalem include comprehensive walking tours of the Old City with all the Christian shrines along the Via Dolorosa including the Church of the Holy Sepulchre with Calvary and the Tomb of Christ, the Dome of the Rock and the Al-Aqsa Mosque, the Western (wailing) Wall, the restored Jewish Quarter, the Cardo Maxima, the Citadel, and David’s Tomb. The Mount of Olives includes the place of Christ’s Ascension, the Church of the Lord’s Prayer, Dominus Flevit Church, the Garden of Gethsemane and the Basilica of All Nations. Mount Zion includes the Church of St. Peter of the Cockcrowing, the Dormition Abbey, the Upper Room, and Zion Gate. Also visited may be the Garden Tomb and Gordon’s Calvary. In West Jerusalem, one can visit the Israel Museum and the Shrine of the Book, the Model of 2nd Temple Jerusalem, Ein Karem, the Chagall Windows in the Hadassah Medical Center, and the business and government district of Israeli Jerusalem. Built by Emperor Constantine in 335 A.D. on the very site of Christ’s resurrection, the Holy Sepulchre houses the Calvary or Golgotha and the tomb of Christ. The building was destroyed in successive wars, transformed in the Persian period and finally rebuilt by the Crusaders. During restorations following the fire of 1808 and the earthquake of 1927, it was possible to determine the topography of the Golgotha and the tomb of Christ. The Holy Sepulchre has private and communal areas. The former are given to the seven communities who share the church while the communal areas are under the authority of the Armenians, Greek Orthodox and Latin churches. 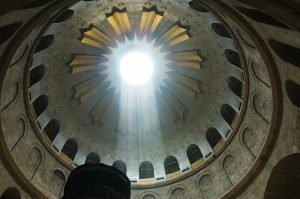 A two million dollar renovation project of the rotunda of the Holy Sepulchre was completed at the end of 1996 with inauguration ceremonies on January 2, 1997. Jesus was crucified in Jerusalem, probably on April 7, 30 A.D. For Christians, the “Son of God” began a different era with his sacrifice announcing freedom from sin and death by his resurrection. In memory of Jesus, Christian pilgrims from all over the world travel the Via Dolorosa from Antonia, Pontius Pilate’s seat of government, to the basilica of the Holy Sepulchre, built on Golgotha, the “hill of the Skull”. The Via Dolorosa is the route symbolizing the bearing of the cross with Christ. Covering about one sixth of the old city of Jerusalem, the Haram el-Sharif (Noble Sanctuary) is a concentration of some of the most magnificent architecture in the Holy Land. The Haram el-Sharif with its trapezoidal shape, has fifteen gates for entrance including the Maghreb Gate (Dung Gate), located by the Wailing Wall. The most famous building in the Haram el-Sharif is the Dome of the Rock (“Qubbat el-Sakhra” in Arabic). This jewel of the Holy Land, casts the glory of its golden dome all over Jerusalem. The Dome of the Rock is an octagonal structure, superimposed on two squares offset by an angle of 45 degrees. Its layout, subject to complex geometry has made it a model for later Islamic architecture. The dome is formed by two superposed cupolas, between which a space was worked in to protect the decoration from the climate. An epigraphic strip 262 yards long, to the glory of Jesus, a prophet according to Islam, runs around the drum. The rock in the middle of the dome, where Abraham prepared to sacrifice his son Isaac, symbolizes the center of the world in Muslim geography. The Faithful can make out the footprint of the Prophet, as well as the handprint of Gabriel. The cave under the rock is called the “Well of Souls’, where tradition maintains the souls of the dead linger before disappearing. The external decoration of mosaics has been restored many times. Suleyman replaced the Omayyad and Ayyubid pottery with Persian ones. These gave way in 1964 to Armenian glazed tiles, surmounted by a frieze with verses from the Koran. The El-Aqsa Mosque was built between 705 and 715 at the southern part of Haram el-Sharif. The largest mosque in Jerusalem was destroyed several times by earthquakes and now has only a few elements of its original Omayyad structure. The main part of the building is the work of the Fatimid caliph of Egypt, El Zahir who restored the mosque in 1035. The Crusaders and the Ayyubids performed additional modifications to the mosque, making it a mixture of architectural styles. The need to counter balance the prestige of the Byzantine masterpieces, particularly the Holy Sepulchre, was all-important in the building of this monumental mosque. The seven arches of the portico echo the seven parts of the layout of the Holy Sepulchre. The Western Wall is the last of the remains of the ramparts that surrounded the Holy Temple of the Jews, built by Solomon and destroyed by Nebuchadnezzar, rebuilt by the Babylonian exiles and by Herod, and burned down by Titus. From the day after its destruction, Jews gathered to weep and pray on the ruins of the Temple. They later had to pay the Romans to pray there. 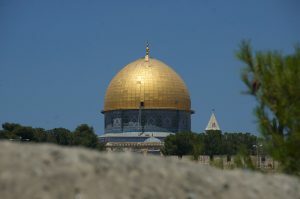 When the cupola of the Dome of the Rock covered the ruins of the Temple, only one side of the holy structure remained. The Western Wall is the symbol of the Jewish people who believe the Shechina (Divine Presence) soars above it. Most of the wall’s huge stones come from the Second Temple, with the foundations dating back to the time of Solomon. Often referred to as the Kottel (Holy of Holies), the Western Wall is busy at the beginning of Shabbat and on the High Holy Days. 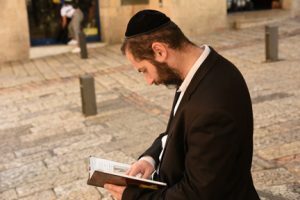 Each year on the 9th of Av (July-August), the anniversary of the destruction of the Temple, tens of thousands of Jews gather at the Western Wall to say prayers of mourning.